To care for thornless blackberries, start by giving the plants what they need to grow happily in the garden. Full sun, well drained soil and attention during the proper times of the year ensures a bountiful harvest from these pretty and useful plants. Traditional blackberry bushes, whether cultivated or wild, sport long, sharp thorns on their canes. Thornless blackberries have been available for decades, but recent innovations have made them available to almost all gardening zones. Select thornless blackberry varieties suitable for your gardening zone. Purchase them at your local garden center or if shopping from a catalog, look for ones marked as hardy for your particular zone. If you're not sure, don't hesitate to call the catalog or online nursery and ask for advice. Most thornless blackberry plants produce abundant berries no matter which variety you choose. Plant thornless blackberry plants approximately three to four feet apart in a sunny location. They require a trellis or support of some kind. You can grow them against an existing fence or create your own support using wooden poles, metal stakes or PVC pipes. A simple H-shaped fence provides adequate support. Stretch wire between the posts to provide additional support. If you don't provide support for the plants, the long canes tend to trail on the ground. This makes the berries easily accessible by rodents and other creatures and reduces the harvest. To train the canes along the wires and posts, use garden twine and tie them to the trellis. 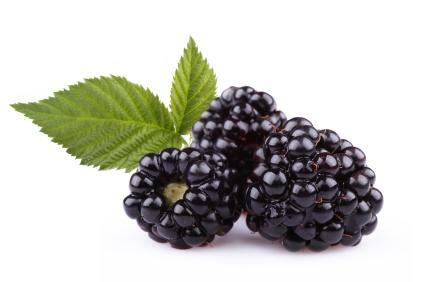 Plant blackberries in a sunny location in well drained soil. Add as much compost as you like to the planting hole. Keep them well watered until the root system is established. Mulch around the base of the plant to retain moisture and suppress weeds. During the first year, the plant may produce few, if any, berries. Don't lose heart. Thornless blackberries begin bearing a hearty crop during their second year. In the spring, you should see large clumps of pretty pink flowers on the plant. Later after the flowers are pollinated, blackberries form. Berries are ripe when they turn completely black. Thornless blackberries tend to be larger and some say juicier than other types. The most important tip to care for thornless blackberries is pruning. Thankfully, because they lack thorns, pruning is an easier task than pruning conventional blackberry plants which practically require a suit of armor to prune without a scratch! During the summer, you can prune off the tips of new canes to keep the plants between three to four feet tall. You can let them grow taller but it won't enhance berry production and may make it more difficult to trellis and care for the plants. Some types of thornless blackberries such as Cherokee and Cheyenne require pruning off the root suckers that emerge near the base of the plant. Suckers emerge from the crown during the growing season. Allow them to get about 12 inches long, then trim them to keep them that length. Anytime the larger central branches of the blackberry plants grow beyond three feet, it's time to prune them. Use very sharp, clean pruning shears and snip off the tips. During the wintertime, you can prune back the side branches to about a foot long. Winter is also the time of year to prune off any dead or diseased branches. North Carolina State University information on thornless blackberries. West Virginia Cooperative Extension Service handout on thornless blackberries. The Vegetable Gardener provides personal insight into her blackberry care regimen. Doyle's Thornless Blackberry, one of the most popular plants. It takes some work to care for thornless blackberries, but the rewards are great. Just imagine those delicious berries you'll get to harvest when all your efforts come to fruition!